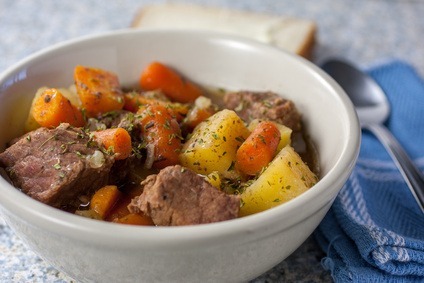 Bake a loaf of bread and grab this vegetable beef soup recipe. I've also included a wonderful beef stew seasoning recipe below. You will be thanked over and over at dinner time for making this masterpiece. Slowly cooked to perfection. In a dutch oven or stock pot, heat canola oil and add the roast pieces. Season with garlic and onion powder; cooking/stirring until browned on all sides. Remove the meat. Add the carrots, celery, onion and mixed vegetables. Saute until tender. Add the beef broth and remaining ingredients. Bring to a boil and simmer for 2 hours. Serve with homemade bread and a salad. In a heavy skillet, heat the canola oil over medium heat. Place the flour, seasoned salt, garlic and onion powder in a resealable bag and shake. Add the cubes of meat and shake well to cover evenly. Fry the pieces in a skillet until browned on all sides. Add onion to the cubes of meat and saute until tender. Pour into a slow cooker. Mix the worcestershire sauce, beef broth and wine together and pour into the bottom of the skillet and scrape to deglaze the bits from the bottom. Pour all of this into the crock pot over the beef and onions and mix well. Add potatoes, celery, carrots and onion. Sprinkle the beef stew seasoning over all. Place on high for 4 to 5 hours or on low for 8 to 10 hours. Place in a resealable bag and shake to mix. Add two to three tablespoons per 2 pounds of meat. Makes approximately 1-1/2 cups. of chicken breasts, or add chunks of leftover beef roast. Serve with grated cheese, rolls, and sour cream. Very satisfying meal. You may also substitute the water for chicken or vegetable broth. Place all ingredients in a slow cooker on low for 8 hours. You can also place on the stove in a dutch oven and simmer for 2 hours. 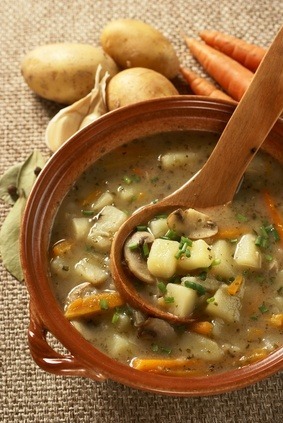 Saute the potato, celery, carrots and onions together in olive oil until almost tender. Add the broth and V8. Put the remaining ingredients in and simmer for 1 hour, or until all vegetables are completely cooked. 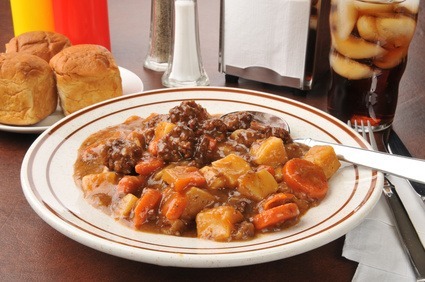 I have more than a vegetable beef soup recipe, please check out more homemade recipes below.